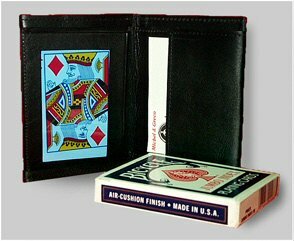 With this card case you will be able to perform all the effects you do with a Himber Wallet but with a more natural casual and daily design. You will be able to produce vanish switch or change all kinds of flat objects like playing cards credit cards personal cards bills or envelopes. This is one of the best utility props to be used in magic or mental routines. Ideal to exchange gaffed cards for normal ones. . It is made by the most experienced craftsmen with the finest leather quality. Fits in the back or shirt pocket. Ideal for restaurant or strolling magic.